Michelle Wie "holed the best putt of my career" to win the Women's World Championship in Singapore - her first victory since the 2014 US Open. The American, who began the day five off the lead, sank a 40-foot putt - her seventh of a bogey-free 65 - on the 18th to win by one shot on 17 under. Nelly Korda missed a nine-foot birdie putt to force a play-off while Jenny Shin bogeyed the last to end 16 under. "It was crazy, my head's running at a million miles an hour," said Wie, 28. "I wanted to win really badly, especially after what happened last year, I had some unfinished business. I knew if I shot seven, eight under I'd have a chance and that was my one and only goal." 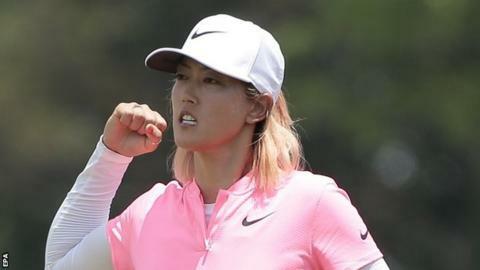 Wie had led going into the final round last year but a four-putt double bogey on the par-five fifth checked her challenge as Inbee Park won with a then course-record at the New Tanjong Course of 64. This year, it was Wie on the charge, with three birdies on the front nine and four on the back in her 65. South Korea's Shin, playing in the group ahead of Wie, was also having an excellent final round, holing eight birdies in 11 holes from the sixth to reach 17 under. However, an errant approach and duffed chip at the last led to her first bogey of the day as she also signed for a 65 to finish alongside Brooke Henderson of Canada, and American pair Danielle Kang and Korda. Wie's birdie on the last meant overnight leader Korda had to also pick up a shot at the last and the 19-year-old drilled her approach to nine-foot but her putt drifted wide. Kim Sei-young briefly threatened to shoot an LPGA-record matching 59 but a bogey on the 16th stalled her progress and the Korean had to settle for a course record 10-under 62 to finish in a tie for 10th on 12 under. Meanwhile, England's Meghan MacLaren picked up her maiden Ladies European Tour title with a two-shot victory at the Women's New South Wales Open.